Upgrade enjoyment, safety and reliability with these rectangular single pedestal tables. Building upon a classic design, these expanded metal tables are meticulously engineered to deliver top grade structural integrity. The main pedestal column is constructed with 4" x 4" powder-coated commercial grade steel tubing supporting the table top, extension arms and the bench seats plus plenty of outdoor enjoyment. 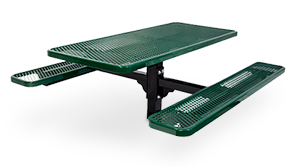 The expanded steel tops and seats are finished in an impact, weather, vandal resistant and UV stabilized thermoplastic polyethylene, protecting against the spectrum of seasonal elements. This rectangular table is a great addition to provide reliable seating in public areas. Surface and in-ground mountable models are available—all models complete with stainless steel hardware.